Wouldn’t you pay another $1.50 to see a remastered version of that scene with Fat Yoda executing all those whirlwind, acrobatic-ninja moves? Fat guys make everything funnier. Just ask Larry the Cable Guy or that dude from Paul Blart: Mall Cop. Oh, the hilarity. Anyway. Cake-making hobbyist Kate crafted this Fat Yoda* cake for her son’s seventh birthday. The Yoda head is made of molded Rice Krispies treats. 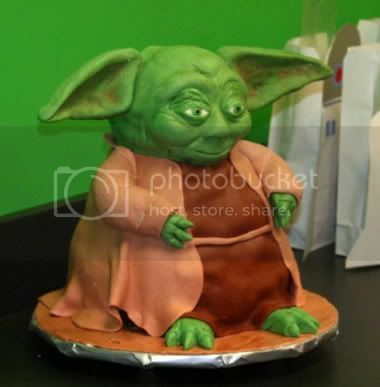 The body of Yoda is a dense chocolate cake. I frosted the cake with a vanilla buttercream and covered that with marshmallow fondant. Yeah, I guess “dense” is a good way to put it. And cheers to Kate for details and for the results–pretty impressive for someone who’s only used fondant a “handful” of times. Check out a few more cakes in her Flickr set. The Friar Tuck of Yodas! I dunno, Slowly Imploding Jedi cake made of MOIST, DENSE, CHOCOLATE sounds like YUM to me! LOL! Fat Yoda cake kinda creeps me out, but he looks delicious. GWS, I have to disagree with you. The Yoda fight was kind of a letdown. The only good thing about Ep2 was the hovercar chase through Coruscant. Oh, and the sweet love story. @nickolai: I see what you did, there.